The primary reason for the partial government shutdown is the impasse over President Donald Trump’s proposed wall on the Mexican border. Democrats have taken a hard stance opposing the wall and the Trump administration has been holding firm in its position. 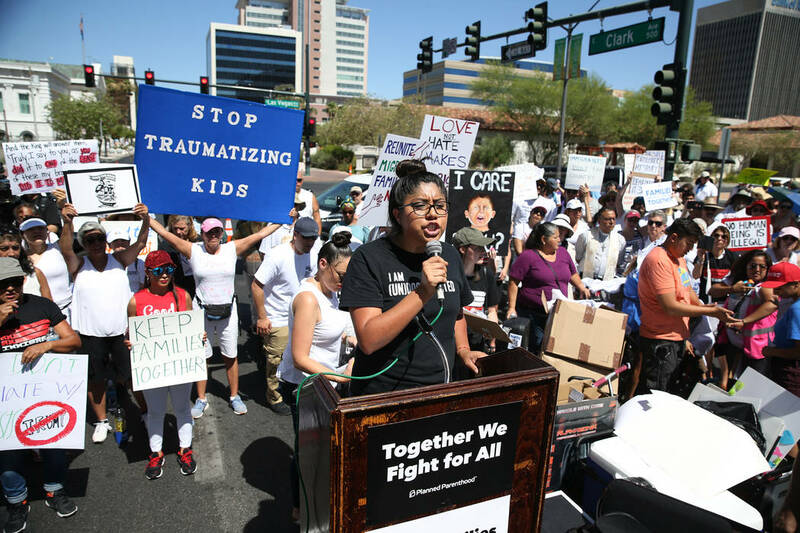 Erik Verduzco/Las Vegas Review-Journal Erika Castro, organizer for the Progressive Leadership Alliance of Nevada, speaks during a rally against the separation of immigrant families outside of the Lloyd George U.S. Courthouse in Las Vegas, Saturday, June 30, 2018. Whether or not the wall would be effective is irrelevant to voters, it is the symbolism of the border wall that brings out strong emotions both for and against it. Merriam Webster’s Dictionary defines symbol as “an act, sound, or object having cultural significance and the capacity to excite or objectify a response.” The defining feature of American politics for the last half-century has been our increasing reliance on symbolism. Before the border wall, we were deluged with media coverage of the symbolism of NFL players protesting by kneeling during the national anthem. Emotions were high as Colin Kaepernick’s role as the instigator of the protest sparked angry talk of boycotts, throwing away Nike shoes and the like. In our hyper-connected society, symbolism is used to instantly grab our attention and solicit an emotional response. Symbols work well in our free enterprise society when you are trying to sell your goods or services to consumers, in politics not so much. One of the problems with symbolic politics is that it’s hard to compromise, because symbolism enlists ideas of honor and identity that leave little room to find a solution on common ground. The symbolism has become more important than the reality. The president has offered to compromise, offering the Democrats a package on immigration to end the nearly month-long partial government shutdown. But for the Democrats, any compromise would be a symbol of defeat. By focusing on the symbolism of the wall, either for or against, there can only be two outcomes. One side wins, the other side loses. Symbolic political ideology is never the best way for our capitalistic society to solve issues. Rather than trying to win a symbolic war, our politicians would better serve the voters by finding solutions within our free enterprise system. A comprehensive immigration policy driven by the realities of the job market combined with our social values needs to be implemented immediately. Rather than squabbling over a wall while hundreds of thousands of good Americans are not receiving their paychecks, our politicians need to put in the hard work of coming up with a real immigration policy. The overwhelming majority of immigrants (legal and illegal), come to the Unites States for one reason – jobs. When immigrants came through Ellis Island it was to an America that held open its arms to immigrants. Unlike today’s broken immigration system, the focus was on hard work, and we allowed the market, rather than the federal government, to determine how many immigrants passed into America each year. Washington can start to fix our immigration system by returning power to our free market system, letting the free market do what the federal bureaucracies are failing to. The shift in our immigration policy from a largely market-based system to a red tape-laden, quota-based one has forced the rate of legal immigration far below the market’s demands. Lawmakers refuse to acknowledge that our current laws make undocumented border crossings much more likely. Because the present system merely encourages illegal immigration, Congress needs to enact reform that would put employers back in the drivers’ seat and the federal bureaucracy back to a supporting role. Whether the wall is built or not is irrelevant until the politicians in Washington put in place a free market immigration plan. While the politicians sit idly accomplishing nothing, hundreds of thousands of Americans are affected. Symbols don’t pay the bills.